Next Friday (Sept. 22) through Sunday (Sept. 24) is called Parents' Weekend at Sam Houston State University, but family, friends and area residents are all invited for events that offer a little something for everyone. The theme for this year's event is "Sammy For President," but Sammy has reportedly told his closest advisers that if nominated he will not run and if elected he will not serve. The weekend kicks off with a Leadership Reception for campus organization leaders and their families from 7-8 p.m. Friday in the Lowman Student Center Ballroom. Saturday's events begin with registration at 9:30 a. m. in the Lowman Student Center lobby. Participants in the day's activities can register or get information there any time during the day until 3:30 p.m.
Several events begin at 10 a.m.--a Sorority Open House at the sorority houses, until 11 a.m.; caricatures in the Lowman Student Center lobby, until 4 p.m.; Raven's Rendezvous at the Sam Houston Memorial Museum complex, until 3 p.m.; and a lecture and book signing by author and SHSU graduate Eddy R. Parker, until noon. Raven's Rendezvous will include demonstrations of frontier and pioneer lifeskills, open-hearth cooking, blacksmithing, pottery-making, weaving and spinning, Native American crafts, and black powder weapons firing. Parker is the author of "Touched by Fire," a book inspired by a collection of letters from three Walker County soldiers--named Lewis, Powell and Smither--who served in the Civil War. Books will be available in the Walker Education Center gift shop. Also under way throughout the day at the gift shop, from 9 a.m. until 4 p.m., will be a front porch sale. Also at the museum complex, Sam Houston's Friends of Traditional Music will perform folk music including bluegrass, Celtic, blues and other acoustic pieces, from 4 - 10 p.m. The Parents' Association meeting is scheduled for 11 a.m. to noon in Lowman Student Center 303, with the Cafe Belvin dining hall open for lunch from noon until 1:30 p.m. The Gaddis Geeslin Gallery will have a rare Saturday afternoon opening, from 1-4 p.m., for an exhibit by artists Michael Farrell, Dana Moore and Corrie McCluskey. The gallery is at 1028 21st St. on the southwest corner of the SHSU campus. At 1:30 p.m. in the Recital Hall, 17th and Ave. J., some of SHSU's finest vocal talent will perform with the Chorale and Concert Choir, until 2 p.m.
From 1:30 - 4 p.m. children's movies and playtime is scheduled for the Baptist Student Union, also near 17th and Ave. J. From 2-4 p.m. tours of the historic and restored Austin Hall and Peabody Buildings will be offered, with casino games in the Lowman Student Center Ballroom from 2-4:30 p.m. The traditional Parents' Weekend barbecue is scheduled from 4:30 - 6:15 p.m. in Johnson Coliseum, with entertainment and a Kat Kall pep rally prior to the football game between SHSU and A&M-Kingsville at 7 p.m. at Bowers Stadium. The Alumni Association tailgate party will be under way in the Bowers Stadium parking lot from 5-7 p.m.
Sunday events include breakfast at Cafe Belvin from 8-10 a.m. and an interdenominational worship service from 10:30 - 11:30 a.m. at the Old Main Memorial. The Sam Houston Memorial Museum complex will also be open from 9 a.m. until 4:30 p.m. Combination tickets for the barbecue and game are $14 each, and should be reserved by Wednesday (Sept. 20). Students on any meal plan will be admitted free to the barbecue. For information on any of the events, call 936.294.1785. Clive Swansbourne, coordinator of piano studies at Sam Houston State University, will present the first of a series of four recitals entitled "Beethoven's Music In Its Time" at 7:30 p.m. Tuesday (Sept. 19) in the Recital Hall. The series is sponsored by a University Faculty Research Grant. "Each recital in the series will include works by Beethoven alongside works of his contemporaries, both well known and lesser known," said Swansbourne. "The first recital will include Beethoven's magnificent and stormy 'Appassionata' Sonata and an earlier sonata in a lighter, happier mood. The program will begin with Clementi's Sonata in B minor, a work which clearly shows the influence Clementi had on Beethoven, who admired and closely studied his music. Additionally there will be impromptus by Schubert and Vorisek." British pianist Swansbourne studied at the Royal College of Music in London, and later received his doctorate from Yale School of Music, where he studied with Ward Davenny and Claude Frank. 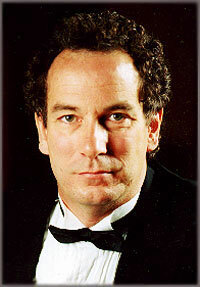 A major prizewinner in the Maryland International Piano Competition, he has toured widely throughout the United States, and has performed to critical acclaim in big cities here and in Europe and Canada. Swansbourne has also broadcast on National Public Radio's "Performance Today" and for the BBC in Great Britain. In the past decade he has performed two series of eight concerts comprising the 32 Beethoven sonatas. The Philadelphia Inquirer wrote of one of his performances--"Swansbourne's playing was like a pool in the forest - of great mystery and beauty," and the Frankfurt Neue Presse praised his "complete artistic and technical sovereignty." The second concert of the four-part series is scheduled Nov. 14. Dates for the third and fourth have not been announced, but will be during the 2001 spring semester. Admission is $8 and $5 (students and children). Tickets will be available at the door. Chad Yarborough, right, an accounting major in the College of Business Administration at Sam Houston State University, has recently returned from Washington, D.C. where he completed the Honors Internship Program with the Federal Bureau of Investigation. Yarborough was one of 56 students chosen from more than 6,500 applicants nationwide to participate in the program. While in Washington he worked side-by-side with special agents and professional support personnel at FBI Headquarters. Highlights of the program included participation in the Attorney General Quorum with Attorney General Janet Reno, training demonstrations by the Hostage Rescue Team and Washington field office SWAT team, and meetings with assistant directors from each division of the FBI. At the FBI Academy shooting range in Quantico, Va., Yarborough received weapons training on a variety of FBI firearms including the fully automatic MP-5. 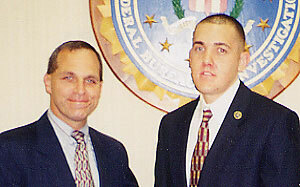 His internship concluded with a luncheon hosted by FBI Director Louis Freeh, left. "The Federal Bureau of Investigation is one of the most respected and sophisticated law enforcement agencies in the world," said Ross Quarles, who chairs the accounting program. "Competition for its Honors Internship Program is keen, as participants are not only reimbursed for travel expenses but also receive a salary at the GS grade level 7 during the three-month program." The FBI Honors Internship Program is limited to junior-year students majoring in a technical discipline suitable to the FBI's long-term needs, specifically accounting, information systems, engineering, law, foreign languages and the physical sciences. Academic qualifications also include a cumulative grade point average of 3.0 or above. Additional information regarding the program can be obtained from the any local FBI field office. FBI activities include investigations into organized crime, white-collar crime, public corruption, financial crime, fraud against the government, bank robbery, extortion, terrorism, foreign counterintelligence and other violations of federal statutes. Mary Evelyn Collins may be a college professor and chairperson of Sam Houston State University's charity fund drive, but she is not immune to "my dog ate my homework" type problems. In her case it was, "my cat ate my pledge form." With the September State Employee Charitable Campaign half completed, Collins said that faculty, staff and students have time to turn in their pledge forms, and more forms are available. "I had filled out my form and was going over it at the dining table when my orange tabby cat, Calhoun, jumped up on the table to take a look. He became so interested that he took hold of the form by its perforations at the top. He and I got into a sort of tug of war. Calhoun won," reported Collins. Professor Collins' cat is named for the famed southern orator, John C. Calhoun. "When I pieced the form back together I realized that I had incorrect math, so I would have had to get a new one anyway," admitted the committee chair. Asked why the cat had taken such an interest in the form, Collins theorized, "He likes to look at anything I am reading, but I would like to believe that he was just making sure that I had listed his favorite charity, the Rita B. Huff Humane Society, on my list of pledges." Anyone needing a form can call 936-294-1970 or 936-294-1497. Focus on the charity continues Sept. 18-22, with visits to the campus by the American Red Cross, Tuesday, Sept. 19; the Montgomery/Walker County Council on Alcohol and Drug Abuse, Wednesday, Sept. 20; the Boy Scouts of America, Thursday, Sept. 21. The groups will have a table in the LSC Mall area. Faculty and staff, as well as students, are invited to visit the representatives of these service groups who are listed among local charities in the 2000 State Employee Charitable Campaign. An exhibition featuring digital inkjet prints by Michael Farrell, photo manipulations by Dana Moore, and gelatin silver photographs by Corrie McCluskey opens Monday (Sept. 18) in the Gaddis Geeslin Gallery. McCluskey said she uses black and white photography to capture images of settings that people "have left behind like empty skins. My subjects are often backyards, back alleys, back doors and hallways of structures. What absorbs my interest is the spirit of the place itself with its inherent memories of the past still lingering, something lost, old, left behind, fleeting." Farrell said that his work consists of digital photographs "that explore the interaction of light and form, and how that interaction shapes our experience of place." The exhibition in the Gaddis Geeslin Gallery will continue through Oct. 12. A reception will be held there from 5-7 p.m. Thursday (Sept. 21). The Gaddis Geeslin Gallery is located in Art Building F in the SHSU art complex at 1028 21st St. on the southwest corner of the SHSU campus. Gallery hours are noon to 5 Monday through Friday, with a special 1-4 p.m. opening Saturday (Sept. 23) during Parents' Weekend. For more information call 936.294.1315. Enrollment for the 2000 fall semester is 12,357, according to figures released last week by the Sam Houston State University registrar's office. This is 142 students, or just over one percent, more than registered last fall. Joey Chandler, director of Undergraduate Admissions, attributed the increase to hard work by her recruiting staff as well as university faculty and staff overall, and the positive reports on Sam Houston State University passed on by present and former students. Scholarships have also been increased, enabling some students who would otherwise not be able to attend college to do so. Working With Word 2000--Level I will be presented by the Small Business Development Center, 2424 Sam Houston Ave. from 6 to 9 p.m. Tuesday (Sept. 19), with fee of $25, and reservations at 936.294.3737 encouraged...A faculty recital featuring clarinetist Robert Walzel, who chairs the Department of Music, is scheduled for 7:30 p.m. Thursday (Sept. 21) in the Recital Hall, with free admission...A Welcome Back Reception for SHSU Faculty & Staff, presented by the Office of Alumni Relations, is scheduled for 5-8 p.m. Thursday (Sept. 31) at Casa Tomas Restaurant...Working With Excel 2000--Level I will be presented by the Small Business Development Center, 2424 Sam Houston Avenue, from 6 to 9 p.m. Thursday (Sept. 21) with fee of $25, and reservations at 936.294.3737 encouraged.